This is a very complicated issue with many twists and turns. I have provided quite detailed information below. You may lose the will to live rather than read it all, please feel free to email me with a question you need answering, I don’t mind. If you notice I have made a mistake in the copy, please let me know, I don’t mind being wrong and I would rather get it right. Below is a table providing you with a broad overview of the types of seats available and the relevant weights, heights and age ranges applicable. The seat must be compatible for your car. Get the retailer to demonstrate how to fit it. Make sure it is fitted as per your manual. Some companies have a list of vehicles that their seats have been tested with. If the child seat has a support leg, this must NOT be positioned over a floor storage compartment unless the compartment has been properly strengthened. If you are buying the latest i-Size seats your car will need to be able to fit this type of seat. Your vehicle retailer or car manual will be your best source of information. This is an internationally recognised system to fit child seats in vehicles in a standardised way without the use of seat belts. They are generally easier to install and less likely they will be installed incorrectly. The connection points are permanently connected to the body of the car. Most new cars come with fixings to use a top tether to secure these seats in place. This is the latest development in car seats and is covered under a new set of regulations that will eventually take over from ECE 44-04. These seats are tested to a more rigorous standard than other seats. They offer children more protection in the event of a collision. It is mandatory in the UK that children travel rearwards up to the age of 15 months in one of these seats. You can only use ISOFIX points to secure these seats. The biggest difference when buying these seats is that rather than weight and age, you must use the length and height of the child as the main measure of whether the seat fits the child. 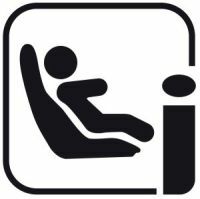 Look for these labels in your car that indicate your car is compatible for an I-Size seat. There are literally hundreds of car seats to choose from and it can feel overwhelming trying to pick the right one. Our advice is do research at places like the ‘Which’ web site, they regularly test child seats for a whole range of important factors, their opinion is impartial. When selecting and buying a new child seat it is the weight of the child that is the most important thing to know for a ‘traditional’ child car seat. You should be selecting a seat appropriate to your child’s weight. There is also an age range provided for the seat, you should ensure your child complies with this also. There is a new standard that is now available and will eventually supersede the ‘traditional’ seat belt or ISOFIX type seat; this is called i-Size. If choosing one of these seats, it is the height of the child that is the relevant measure rather than the weight. The age range should also be complied with. The webbing that holds the child in its seat should be adjusted so that is a secure fit around the child and you should be able to get a finger between the child’s chest and the webbing. Ensure the child’s coat is removed. If you are worried the child is cold, place a blanket over the child and webbing. Rear facing seats, the top of the webbing should be slightly below the shoulders. Front facing child seats, the top of the webbing should be slightly above the shoulders. Keep the child seat manual with your child seat; these are becoming increasingly important from a legal perspective. Your child seat must be up to EU standards (ECE 44-04 or Regulation ECE R129). American child seats are not legally acceptable in Europe. If your seat has a label that the EU standard is ECE 44-03, you should dispose of this seat and get a new one. Child seat life span is considered to be roughly five years, after this time the seat should be disposed of. If the seat is involved in an accident or damaged it must be replaced. Find out if you can claim on your insurance for a new one. Should you choose a front facing or rear facing seat? The latest advice is that young children should be kept rear facing as long as possible. The reason for this is that should you be involved in a head on collision, the forces that your child would be subjected to would be spread across the seat rather than the child’s neck and spine. If the seat faces the front, the child’s head will be thrown forward (a child’s head weighs in the region of 25% of its entire body weight) and significant neck and spinal injuries may result. Newer seats can now allow a child to remain rear facing up to the age of 4 years old. Air bag car technology has improved the safety for car occupants. However, it is now known that a rear facing infant carrier placed in the front of a car with an active airbag is extremely dangerous and can lead to the death of the infant. The new European Directive has addressed this issue by making it a legal requirement to de-activate the front airbag if an infant carrier is placed in the front of a car. It is intended this law will also be introduced in Jersey. Where is the safest place in the car for your child? If your car has a three point harness (lap and diagonal belt) in the centre rear of your car, then this would be the safest place to place your child. If there is only a lap belt, this would be the last seat to choose. The next safest spot is considered to be the ‘nearside’ rear seat. This means the side nearest to the pavement. Once this seat is taken, then the next seat would be the ‘offside’ seat, this means the side furthest from the pavement. You are legally allowed to place your child in the front of a car in Jersey and the UK at any age. This though is the last place you would be recommended to choose, as it is more dangerous than any of the other seats. This is the reason some European countries have decided to not allow children under specific ages to be in the front for any reason. If you are visiting a European country, you will need to check the regulations of that country. Using adult seat belts to restrain children. Should you decide to place a child in an adult seat belt, in your position as the main carer, you would have to have a very good reason for doing this if involved in an accident and the child is hurt. You should always use an appropriate child restraint until the child can safely fit into an adult seat belt. Even if you had complied with the strict minimum of the Law, it is possible that you could be prosecuted under the children’s law if you fail without good reason to provide the correct equipment. Dangers in allowing children to use adult seat belts. Adult seat belts are designed for people who are more than 1.5m in height. Anyone less than this height tends to find the seat belt rubbing against the side of their neck and the lap part of the belt tends to lie across the stomach instead of the hips and pelvic area. Because of the belt rubbing against the neck, children tend to place the diagonal part of the seat belt either behind their back or under the arm that would normally be under the belt, this has the effect of the diagonal part of the belt now being positioned over the stomach and rib area of the body. Occasionally the diagonal is left rubbing against the neck. Should a car occupant place the diagonal part of the seat belt around their back to improve comfort, then all the above forces in a crash will be placed around the stomach area, rather than hip and pelvic area (particularly in the case of undersized children) with the possibility of incurring serious internal injuries. If the diagonal part of the belt is placed under the arm then the above forces will be focused against the ribs and stomach, again with the possibility of causing serious injuries. When left rubbing against the neck, throat and neck injuries may than occur. The only safe way around this problem is to use a booster seat. General advice for the fitting of car seats. 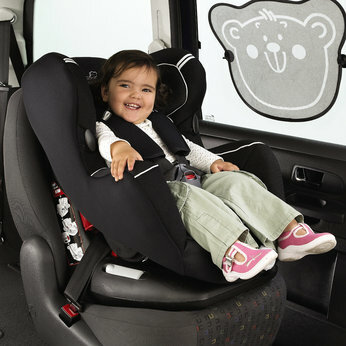 Rear Facing Infant carriers – ALWAYS REFER TO THE SEAT MANUAL INSTRUCTIONS WHEN FITTING A CHILD SEAT. Best location for all child seats is in the rear of the car. But if installing in the front of the vehicle, the air bag MUST be deactivated for rear facing infant carriers. Ensure the length of the seat belt is long enough if using this as the method of installation. The back of the seat that the child’s back rests on should be at an angle of approximately 45 degrees, this is to avoid ‘oxygen desaturation’, this will be most important for children under 6 months of age. When routing a seat belt, pull all of the seat belt out and route it via the ‘blue’ coloured guides and carefully follow the manuals instructions. Make sure the belt is tight and has no twists in the belt. There are sometimes videos available you can watch on YouTube demonstrating how to fit the seat. Make sure the video is approved or made by the seat manufacturer. If the child seat moves side to side, this is fine; they are only designed to restrict forward movement. Ideally, get the retailer to demonstrate how to fit the seat. Normally the carrying handle is folded back, check the owner’s manual for this. If using an ISOFIX connection, ensure both clips are properly ‘clicked’ into place. ALWAYS FOLLOW THE INSTRUCTIONS IN THE SEATS MANUAL. Below are general rules to help you. Best location to fit the child seat is in the rear of the vehicle. 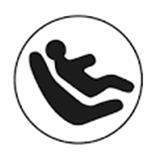 But if using the front of a vehicle, ensure the adult seat is moved as far back from the air bag as possible. Move the head rest out of the way. Pull all the slack through of the seatbelt. Route the seat belt through the ‘red’ coloured guides. Ensure there are no twists in the seat belt, other than a natural twist. Once routed, push your knee into the base of the unit and get as much weight onto the seat as possible. Ideally then get someone else to pull all the seat belt slack through. There is normally a red clip to clamp the seat belt in place. Lift yourself out of the seat and test if secured properly by trying to ‘yank’ the child seat forward; there should be no forward movement. These seats are not designed to stop side to side movement. If using an ISOFIIX fitment. Extend the ISOFIX clamps out as far as possible. Expose the clips at the base of the adult seat that the child seat clips into (there are normally small tags with the picture of a car seat on to show you where they are), clip the child seat into place and push the seat backwards as far as you can. These seats will come with either a ‘top tether’ or a support leg. They must be used; it isn’t enough to only use the seat clips. There will be a clip (with a tag marking it) to secure the top tether to in the boot or parcel shelf and secure to. If using a support leg, it must reach the floor and click into place securely. There is usually a red or green marking on the leg. If you see a red marking, the leg is not installed correctly; green indicates it is installed correctly. Once your child is heavy enough or (tall enough for i-Size fitment when available), our strong recommendation is that you should always use a high backed booster seat for your child rather than a booster cushion without the high-backed portion. Adult seat belts are designed for an average person of 1.5m in height. If you are a lot smaller or taller than this, the seat belt will almost certainly lie across the wrong parts of your body and in the event of a collision; you may well receive unnecessary injuries. Often it is possible to adjust the adult seat belt to fit you properly. The high-backed booster seat will ensure that the lap part of the seat belt lies correctly over the lap of your child, rather than the stomach, the high-backed part of the seat ensures the diagonal part of the belt it directed from the shoulder, to the breast bone to the hip bone. This type of seat will also offer your child much improved head and upper body protection that a booster cushion. If you use a booster cushion only, the diagonal portion of the belt will probably rub against the child’s neck and is positioned badly across the child’s body. With the belt rubbing against the neck, many children then move the diagonal part of the belt behind their back or under their arm. In the event of a crash, they will receive unnecessary injuries if using the belt this way. The European Union have now made it mandatory for all Member States to make it a legal requirement that all children must stay in a boost seat until they are 1.35m (in the UK) in height or they reach 12 years of age, whichever comes first. Jersey is following suit. Below is a table outlining the Law regarding seat belt wearing and the use of child seats. My 7 year old and I are coming to Jersey for a holiday in the summer. We are coming on the ferry in our own car not hiring a car. My question is, is it legal for a child of 7 to sit in the front passenger seat (using a suitable car seat/booster). Although it is not considered the safest place to position a child in the event of a collision, it is legal in Jersey to place a child in the front of a motor vehicle in an appropriate child restraint. If you have any other questions please do get back to us, and we hope you have a nice holiday when visiting our island. Hi Jo, Probably best to contact our Driver & Vehicle Standards Department as this is a little out of the box, http://www.gov.je for contact details. But broadly, if the bus has seat belts, then you should use the seatbelts and in the case of the 6 month old an appropriate child restraint if seat belts are available to enable the use of the child restraint. I hope that helps. We have three children and are renting a car in Jersey in the Summer; however, few hire cars allow for three high-backed seats across the rear. Our children are 1, 4 and 6. Can cushion boosters be used for the older children? Hi Chris, So sorry for the delay in responding. Yes, booster cushions are legal in Jersey at present. Also for a child aged 8 years and a child aged 4 years. My understanding is it should be high backed booster seats for aged 8 & 4 years, but no longer anything needed for the 9 year old. Is this correct? Hi Elke, Apologies for the delay in a response to you and you probably have bottomed this out by now, but for anyone reading this, here is the answer. Your 9 year old should be fine to sit in an adult seat belt from a safety perspective. High-backed booster seats are now advised for all children who still need to be in a booster seat. From a safety perspective if the 8 year old is taller than around 1.5m in height, s/he is fine to be in an adult seat belt. The 4 year old, check it’s weight before transferring to a high-backed booster, if within the weight constraints for a booster seat, then that’s fine. Anyone reading this, please note the Jersey seatbelt law is under review and will be changed to come into line with many if not all of what is now considered best practice. There is presently no date when the legal changes will take place. Hi Thanks for your reply. Just re-reading this. Is the above still the same or has the law changed? Hi Elke, Unfortunately the Law remains unchanged in Jersey, so the same advice applies. Thanks for checking. For best and safest practice go to our page https://jerseysaferoads.com/child-car-seats/ Regards Jersey Safe Roads.